Sew Joy: Let the Party Begin! The Blog Hop is over, but feel free to look through the posts for some inspiration. Thanks to everyone for hopping along with us! 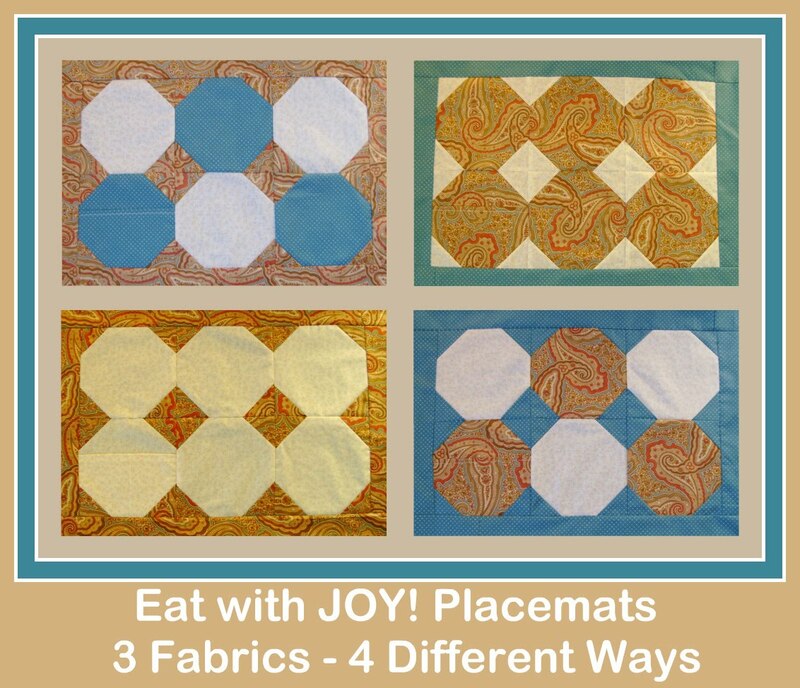 Welcome to the Placemat Party Blog Hop! It will be running all week. Come back each day as I introduce you to the Hostess of the Day. When I first thought of calling it a Party, I really just liked how the 2 'P' words sounded together - Placemat Party. Fun, right? Then Kay asked me to write up a little paragraph for my guest post to tell people about the party. Now I really had to start thinking. . . .
what is a Placemat Party? Placemat Party is where we MAKE Placemats! Each of the Hostesses will show you ones that they made using my pattern. I think you'll be surprised, delighted, and hopefully inspired by their ideas. I am working on a second set of placemats. On each one I'm putting the fabrics on different features. You can see how colour choice and placement of different size prints has on the look of your placemat. This one is my favourite. I think the fabrics are placed to showcase them best. 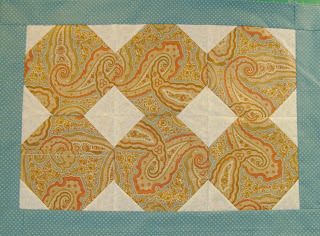 This is another one using 3 fabrics. You can see how the large paisley print struggles for attention on this one. 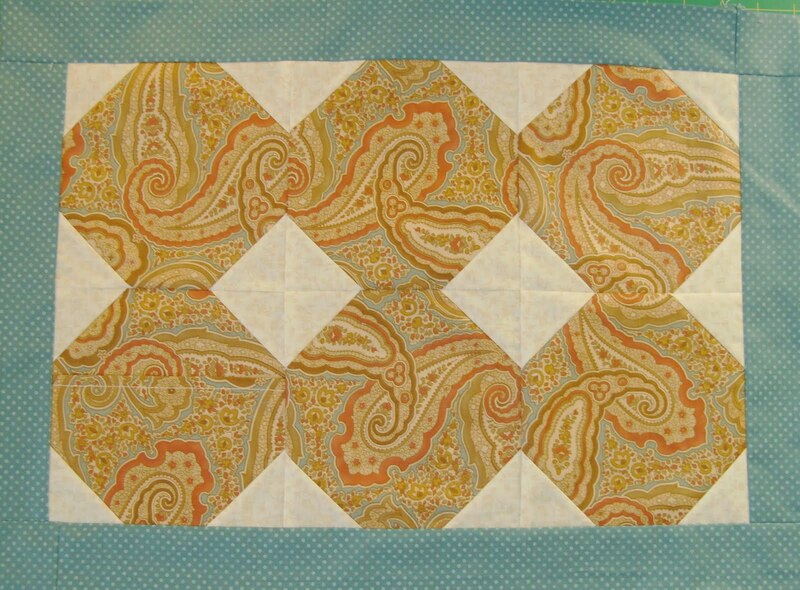 Here's one with the 3 fabrics again, but I did the corner triangles in a different colour from the border. Each Placemat Party Hostess will be hosting a giveaway too! Each Hostess will be giving away a copy, so you have several chances to win. It includes 3 yards of fabric to make your own placemats! Three vintage apron patterns to play with. The first one has been used, but all the patern pieces are there. The middle one reminds me of Anna Marie Horner designs. The third one says it's for vinyl coated fabric. You could try using the new oil cloth fabrics. And party music! A Jason Mraz CD. I was introduced to his music through Quilt Dad and Kathy at Material Obsession. Would you believe that my husband and I bought each other this CD for Christmas?! I've been waiting to include the extra in a giveaway! 1) Leave a comment here. Please, PLEASE, make sure I can contact you. If you are a "No Reply" Blogger, leave your email address in your comment. and link to my blog. Leave me a 2nd comment with your blog link so I can visit you! I will use Random Generator to pick the winner. You can also enter a giveaway at each of the Placemat Party Hostess blogs. WHat a fun idea! I'll come back tomorrow to meet the first hostess! Good luck with the party. I've got mine done. It might not be exactly what you are looking for but I took your idea and made it my own. I'm wednedsay right? I love vintage patterns they are my favorite. I look forward to seeing all the different posts to come. Hey, http://sandy-miss.blogspot.com Here is my link hope it works for you. It's new so not a ton to see yet. what a great giveaway!!! starting on the 30th i'll be having a giveaway in my blog too: www.auroracosecose.blogspot.com and you are invited to participate! yay party~ want to see how others make the placemat. thanks for hosting the giveaway, love the vintage patterns. I know, that it is not a rulepoint,but I am your follower now. I've read about your party at Sandi. I'd love to have a chance to win. 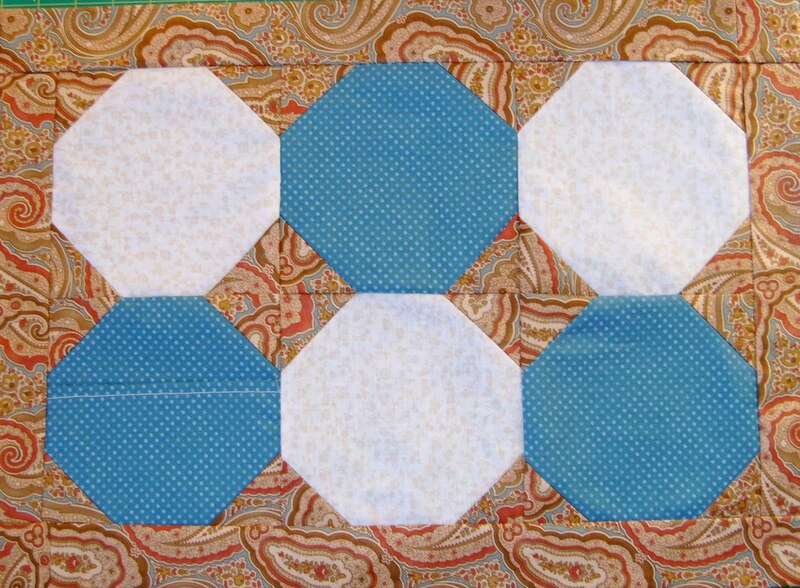 I love placemats as they are easy and quick to make. I like the sound of Placemat Party too :) Just kind of rolls off your tongue. I love how different each placemat looks based on fabric choices. Fun idea, Sarah Vee! Got here through Sandi's blog. Thanks for counting me in. What a great give away. I love your place mats. They are so fun! How fun!!! I love seeing what others are doing. Great giveaway! . I love your placemats! Great giveaway! I would really have fun with this stuff! Love those placemats! Thanks for the chance! I love placemats, they certainly dress up the table for meals. thanks for the chance. What a fun party this is! Glad I didn't miss it! What a great idea for a round robin of placemats! Something quick and easy; instant gratification! I have been thinking about making a few placemats now that it is nice enough to start eating outside! I can't wait to see what the other hostess have come up with! blog hop of placemats...how fun!! Oh my goodness! I do love me those placemats!!! I love these placemats, the little pocket is ingenious! I especially like the bright colors of the first one. I'll be coming back to see what others have come up with. What a cute idea and I love the placemat pattern. Sounds like fun. The placemat is so cute. Wonderful giveaway. Love the vintage apron patterns. Thank you for giving us this opportunity to win. Thanks for the chance to win such a wonderful giveaway. The placemat is very cute. Fun party, nice placemats! and I love the apron patterns. Oh my gosh I LOVE those apron patterns! What a cool idea for a placemat party! They would make great gifts also. I love those placemats!! And what a fun, original giveaway!! What a great idea to host this placemat party. Especially needed for all those "lemonade" guests during the summer, who are stopping in.....I love the flirty McCalls apron pattern (1312). Thanks for hosting the giveaway! What a fabulous fun giveaway! Who doesn't love a party? What a fun event you have planned! Love your placemat pattern. Thanks for the giveaway, too! What a great idea having a placemat party - very cool! And thanks for such a great prize, I have my fingers crossed! What great placemats! I would love to win the pattern for it, as well as those great apron patterns. 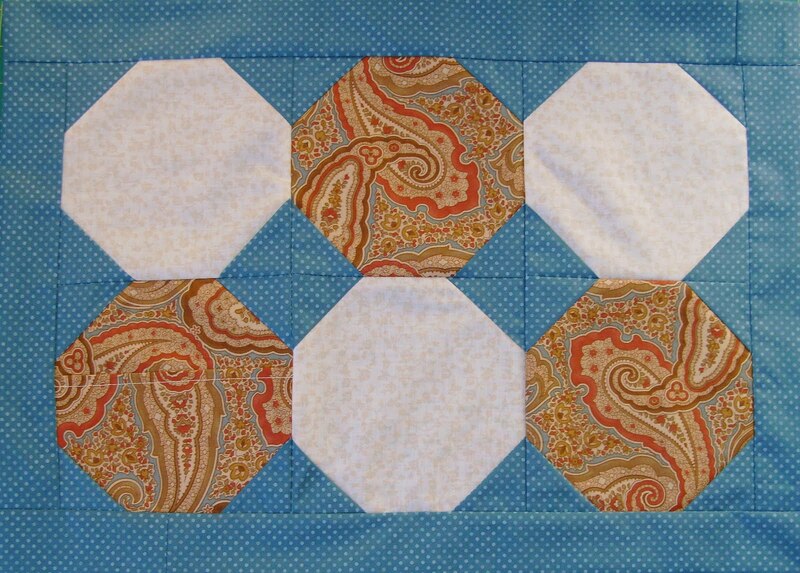 And love, love, love the fabric choices for the placements...my kind of colors. Hello, plese include me, I love your pattern! Terrific placemats, love the pocket! I added your button to my blog. It is fun to see both Sandi and Nanette's placemats. I already follow both of those gals. Thank you for the chance to win. I read about this on Nanette's blog. I love your placemats and can't wait to see more of them! and Jason Mraz is awesome. Well, I have never made placemats because I don't use them. 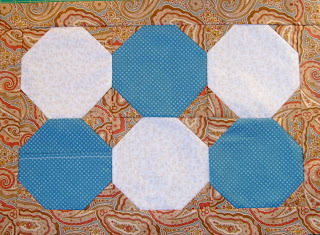 I used to use them, but stopped because the (store-bought) placemats got stained and faded and well, maybe it is time for me to jump into the action and make some quilted ones! So cute.. I love all the placemats! Help me find time to make some!!!!! The placemats look great! I haven' made any in a while. Looking forward to seeing more. I love the placemat, especially the orange and blue one! I also love Jason Mraz and would need to past that CD onto someone else if I'm the winner because I have pretty much all of his music already. It's perfect music for a party! Love the clever placemat pattern! Love your placemats! And the give away looks great. I love vintage anything, and especially aprons. like it! always enter GIVEAWAYS! You're so sweet! Love the fabrics and the placemats and Jason Mraz and well, I'd love to win. Found you through Freda's Hive. So much fun.....love the pattern, the aprons, and would love to win. No blog for me, yet. The Placemat Party is fun....love seeing the different takes on your pattern..all so cute. What a great idea. I love the idea of a placemat party. We use placemats all the time! FUN! What a fun give-away party! Love your placemats and anxious to make them. Thanks for the chance to win! great pattern, love the silverware holder on the side! Great placemats and great apron patterns! I can see your placemats in some really cute fruit/veggie fabrics that I've been collecting. 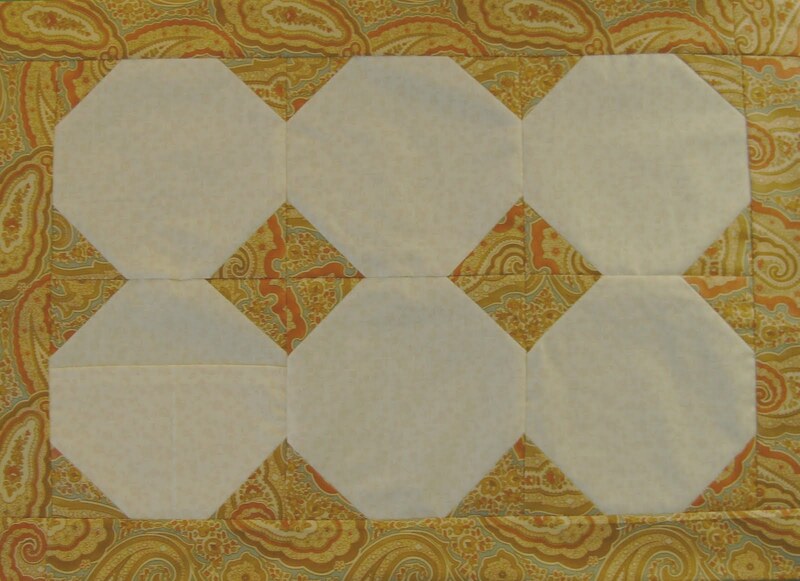 - Looks like a really fun pattern! Love how the silverware fits into the placemats. The last pattern would be perfect with the vinyl coated fabric I just purchased. How wonderful. Love the placemats...thanks for the chance! i also found you through freda's hive! i love your placemats -- they are so dawgone cute. would really like to work with your fabrics and make a set for myself and family, plus the vintage aprons would be a perfect addition. thanks for this great opportunity! I love all those vintage patterns and I really need to make new placemats so this would be perfect! Very neat! Plus winning the fabric, great! Thanks for the chance. Congratulations on your placemat party! It has been a great success. I love all the different placemats you made.